Silent Dinner in Lahore, by Herman B. Mendolicchio. We Never Stop Talking, by Saira Ansari. The Lost Supper or the End of a Beginning, by Quddus Mirza. Performing the (im)possible. A conversation between artist and curator. After the Silent Dinner in Sydney, September 2016. You Had To Be There. Rilka Oakley. Forgetting Real Life. An experiential account by Annette Innis. 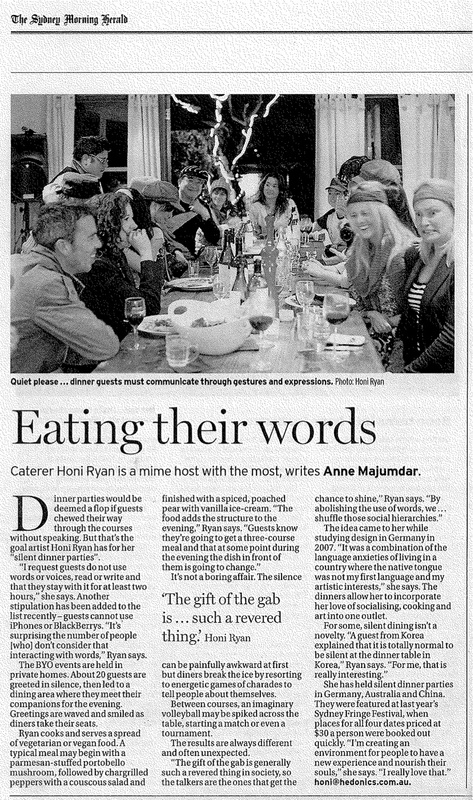 Silent Dinner Parties, by Honi Ryan. Else Journal of Art, issue 0, pg 118, Transart Institute press 2014. A Master of Artistic Research at the University of Amsterdam titled How do we value hospitality today? Taking hospitality further based on the examples of Kipras Dubauskas ‘Lost Hour’ and Honi Ryan’s Silent Dinner Party by Weronika A. Zielinska. Weronika also runs the artist run initiative Upominki in Rotterdam. Project Anywhere – Art at the outermost limits of site specificity, global exhibition. Monuments To Heroic Failure, Dr Sean Lowry in Broadsheet Contemporary Visual Arts and Culture, 2008. A Face to Face with Silence. By Julius John Alam for Art Now, Contemporary Art of Pakistan, Dec 2016. Serving in Silence. By Quddus Mirza for The News on Sunday, Pakistan. World’s Biggest Silent Dinner Party Coming To Sydney, by Emily Blatchford, Huffington Post Australia. Sept 13, 2015. What is a Silent Dinner Party, Honi Ryan teaches Beirut how to eat in silence, Nadine Elali, Lebanon Now, Jan 20, 2012. Eating Their Words, Anne Majumdar in The Sydney Morning Herald, Good Living Guide, June 17 2011. 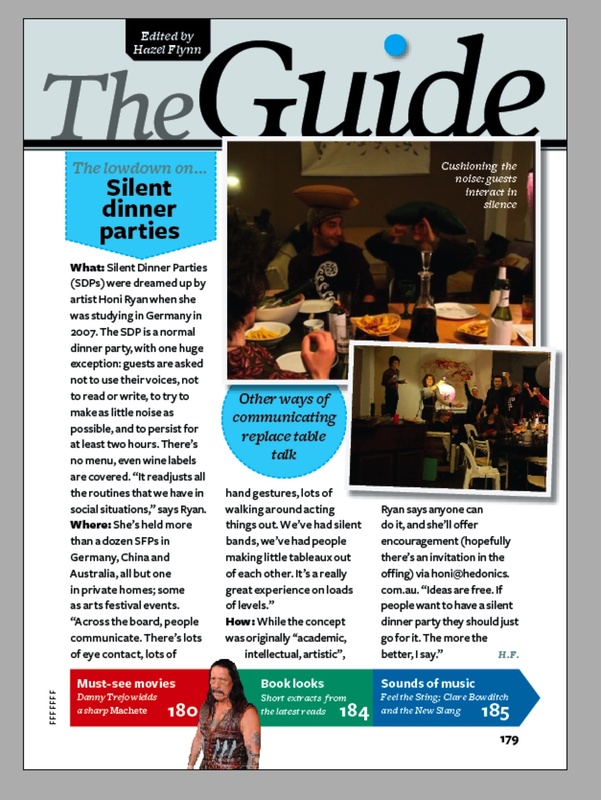 Silent Dinner Parties, Hazel Flynn (ed), Readers Digest, The Guide, Cover, Nov 2010. In The Pursuit of Silence, Danika Houghton. Australian Independent Journalism, Arts & Culture, 2010.